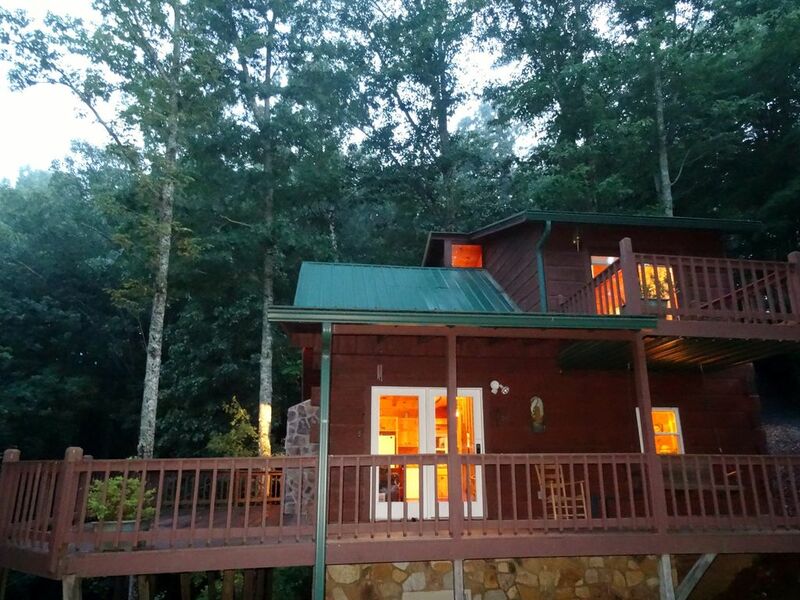 Our beautiful log cabin is located on 3.5 acres of private property in the beautiful, picturesque Appalachian Mountains! Bring your camera and an appetite for fun, or just enjoy the quiet of the mountains. The cabin is just 6 miles down Aska Road and still close to the historic downtown of Blue Ridge in Fannin County. It has 2 bedrooms and 1 and 1/2 baths and will accommodate 4-5 guests. HUGE outdoor deck with picnic table! The mountain road up to the cabin is ½ mile; it is partially paved, partial gravel and it is steep. A low to the ground vehicle is not recommended. 7 NIGHT WEEKS, YOU CHECK OUT ON 8TH DAY! One bedroom has a king size bed, the second bedroom has a queen size bed. There is also a queen sleeper and a twin sleeper to accommodate children. * All the comforts of home! * The Toccoa River where you can enjoy, tubing, canoeing, swimming and fishing. * The famous Toccoa Riverside Restaurant. * Hiking and mountain biking trails. This is my grandchildren and I at Lake Blue Ridge, one of my favorite places in the world! Everyone loves Blue Ridge, great place to make lasting family memories that everyone will talk about forever! Friendly town, lots of outdoor activities, gorgeous weather. RELAX and enjoy life! Many Cherokee would farm in the Blue Ridge Mountains, leaving them during the winter and staying at the Cherokee village of Aska, or "winter home". From extreme south-central Pennsylvania the Blue Ridge Mountains run to the south and west, including land that ranges from high peaks to rolling hills like those throughout much of the southwest portion of Virginia. In southern North Carolina this high eastern ridge turns west, and continues to Springer Mountain, in southern Fannin County, Georgia. While the Blue Ridge range does continue to the west it is at this point that both the Benton MacKaye and Appalachian Trail begin their northward trek along the ridges of the Appalachian Mountains. West of the Blue Ridge range is a second series of mountains that runs from West Central North Carolina to Fannin County, Georgia. In Georgia, this range is known as the Cohuttas; further north they are called the Smoky Mountains. The Cohuttas and the Smokies are part of the Blue Ridge province, yet they are actually geologically distinct from the Blue Ridge Mountain Range and quite a bit older. In Fannin County, Gateway to the Blue Ridge Mountains, the Cohuttas rise in the west and the Blue Ridge to the south and east. Gorgeous Mountain view at 2,500 elevation! There is a huge covered outdoor deck area with dining table that will sit 8 and there are a few portable trays available inside the cabin.